GU placement Nicola MacRae recaps some of her discoveries about Cordelia Oliver and her work amongst the papers of the George and Cordelia Oliver Archive. Sadly, I am nearing the end of my internship at The Glasgow School of Art archives. I have thoroughly enjoyed my time here and have gained valuable experience, for which I am very grateful. As mentioned in my previous post, I have been cataloguing the George and Cordelia Oliver Archive. This is a wonderful, eclectic mix of material and in this post I’m going to highlight some of the work of the late art critic and artist Cordelia Oliver which is to be found within it. For a fuller account of Cordelia’s life and work the obituary which appeared in The Herald is a good starting point. Cordelia’s student days at the GSA during the Second World War is documented through a collection of material relating to the 2001 exhibition ‘Art Booms with the Guns: The War Years at The Glasgow School of Art’. Within this material there are photographs of Cordelia as a student dressed in her hand-made painting skirt standing in the Hen Run of the Mackintosh building. In the 1950s Cordelia worked as an illustrator and her work in this area is well represented in the archive. She provided illustrations for retail catalogues of Jenners and John Menzies and numerous newspaper and magazine articles. During this period Cordelia’s husband George Oliver was the Art Director for the Scottish Motor Traction Magazine (SMT), and Cordelia illustrated many SMT’s advertisements, also to be found in the archive. Not only do these illustrations demonstrate Cordelia’s artistic skill, but also represent a bygone age of travel. 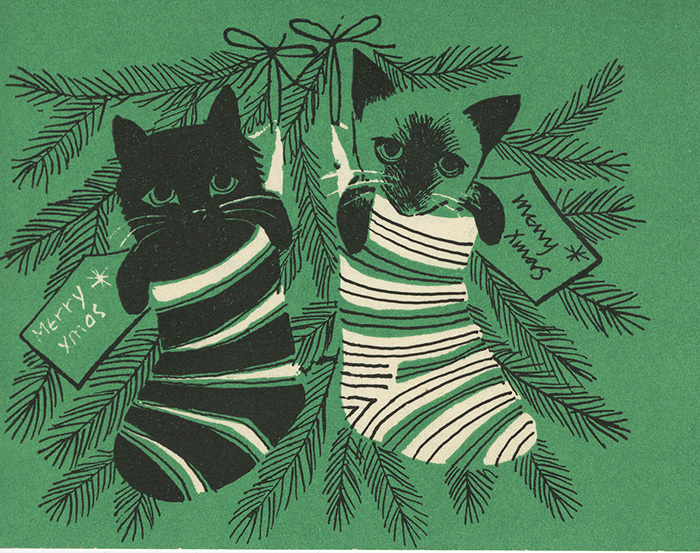 A Christmas card designed by Cordelia featuring two kittens is a personal favourite from the collection! Cordelia was a passionate promoter of the arts and this is reflected within her writing and personal collection of publications. The collection of newspaper cuttings of Cordelia’s writings is substantial and spans the 1960s to the 1990s. During the 1960s her reviews for the Guardian were signed ‘by Our Art Critic’ which is perhaps a reflection of the age in which she was writing; women were still being subject to gender inequality. Cordelia was as gifted with the use of words as she was with the paintbrush. Her skill and knowledge as an artist permeates through her writing and her writing style engages the reader leaving them with no uncertainty as to what her views were! She was not afraid to say what she thought; something to be respected even if one does not agree with her viewpoint. It has been a pleasure working with the George and Cordelia Oliver Archive and I have learnt a great deal about Glasgow, the Scottish art scene of the 20th century and of course the lives and works of George and Cordelia! Whilst cataloguing I have been mindful of the future users of the collection and how they will benefit from it being catalogued and made available to them. Due to the diversity of the material, people of all ages, backgrounds and interests will find something to captivate them and I look forward to hearing about how the collection will be used in the future. There are discoveries to be made together with gaining a greater understanding and appreciation of Glasgow’s past and vibrant arts scene in the mid to late 20th century. Come in to the archive to explore and enjoy!